Play Therapy is a powerful tool when treating children and teens who have experienced trauma. Play therapy offers the child a safe space where they can feel in control, learn how to identify and manage distressing symptoms of their trauma, and give language to what they are feeling within their body and mind. In this workshop, we will explore how trauma impacts the brain, the resulting impact on the parent-child relationship, as well as treat and resolve trauma symptoms utilizing play therapy techniques. By giving children opportunities to work in a permissive setting, you will observe and document how children utilize gradual exposure, gain an understanding of traumatic experiences, discharge affect, and begin to manage experiences that can feel overwhelming or frightening. This trauma-anchored model shows you how to integrate prescriptive strategies as needed with child-centered play therapy. It deepens metaphor work by amplifying the child’s ability to explore the material they externalize, and provides the child with a safe, predictable environment for processing interpersonal trauma. You will learn theory and techniques that values children’s pacing, respects defensive strategies, and seeks to help children build alternative skills to cope with difficult thoughts, emotions or behaviors. In this innovative day-long workshop, you will walk away with creative play therapy tools to use immediately in your practice and the confidence to treat the most challenging of cases. Discover how trauma impacts brain development, and how play therapy can strengthen relationships, and improve behavior. 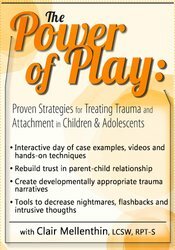 Show an effective evidence-based play therapy techniques that can treat trauma symptoms and can be used immediately with your child and family clients. Clair Mellenthin, LCSW, RPT-S, is a Registered Play Therapist Supervisor and is the past president of the Utah Association for Play Therapy. Throughout her career, she has focused on providing therapy to children, teens, and their families. Clair is the director of Child and Adolescent Services at Wasatch Family Therapy. She is a sought-after supervisor, training graduate students and interns in play therapy, and an adjunct faculty member at the University of Southern California MSW program. Clair is the author of Play Therapy: Engaging & Powerful Techniques for the Treatment of Childhood Disorders (PESI, 2018) and My Many Colors of Me Workbook. (Self-Published, 2013). In addition to being an experienced play therapist and professor, she frequently presents professional play therapy and family therapy trainings and appears on local and national TV and radio as an expert on children and family issues. Financial: Clair Mellenthin is the clinical director at Wasatch Family Therapy. She is the author of My Many Colors of Me Workbook; she maintains intellectual property rights and receives royalties. Ms. Mellenthin receives a speaking honorarium from PESI, Inc.
Nonfinancial: Clair Mellenthin is the president of the Utah Association for Play Therapy. PESI, Inc. designates this self-study activity for a maximum of 6.0 AMA PRA Category 1 Credit(s)™. This activity was originally recorded on 06/18/2015. It was last reviewed on 09/02/2018 and is valid until 09/01/2021.